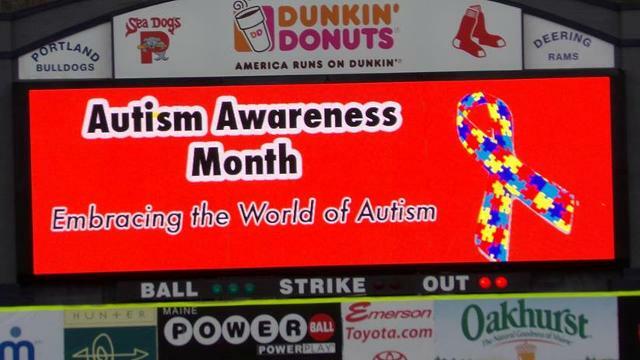 PORTLAND, MAINE - The Portland Sea Dogs in partnership with Embracing the World of Autism will host Autism Awareness Day at Hadlock Field on Saturday, April 20th when the Sea Dogs take on the Trenton Thunder at 1:00 PM. The event will be held with the support of the University of New England Occupational Therapy graduate students. The UNE students will create and facilitate activities for children and families in a special "Sensory Room" that will allow children with autism to self-regulate using movement, calming sensory input and fidget items. Earplugs will also be available. In addition to the "Sensory Room," early entrance into the ballpark will be available for any families who wish to avoid crowds. The goal of the event is to raise autism awareness and to help people with autism perform the occupations of everyday life. Tickets to the game are available at the discounted rate of $6.00. Fans attending the April 20th game are asked to wear the color orange to show support for Autism Acceptance. The Sea Dogs open the 2019 season on Thursday, April 4th at 6:00 PM.